Assalamualaikum to everyone out there. Hope that life is treating you well. As for me, I can’t even express my syukur (gratitude) to Allah for granted my wish for my boy to be accepted into New English School (NES) for the coming school year 2012 – 2013. Last year he was rejected because he refused to sit for the assessment test… crying all the way. Last Saturday, he sat for his assessment test again and as usual I was the one who was so nervous. That morning I can’t even eat my breakfast… macam kita yang nak sit for the test he he he. Anyway, alhamdulillah he will be joining his sisters in NES this September. Now, I can sleep better but that does not mean it will be a smooth sailing after this. It’s gonna be hard work all the way but it will be worth it. NES is one of the best school in Kuwait and the commitment from the teachers are superb. They always have information evening for the parents just to update us on how we can help our children better. During this session, normally we will be asked to do some of the activities that our kids go through everyday. The purpose of those activities are for us to fully understand their teaching methods and hence we can help our children at home by not confusing them with our own teaching method. Let me take an example here, for Mathematics, they really encourage their students to do calculation mentally. So, pen and paper method like we used to do before will only be taught once the kids fully understand the number system. They have Mental Math test every week and there will also be a Mental Math exam every semester. 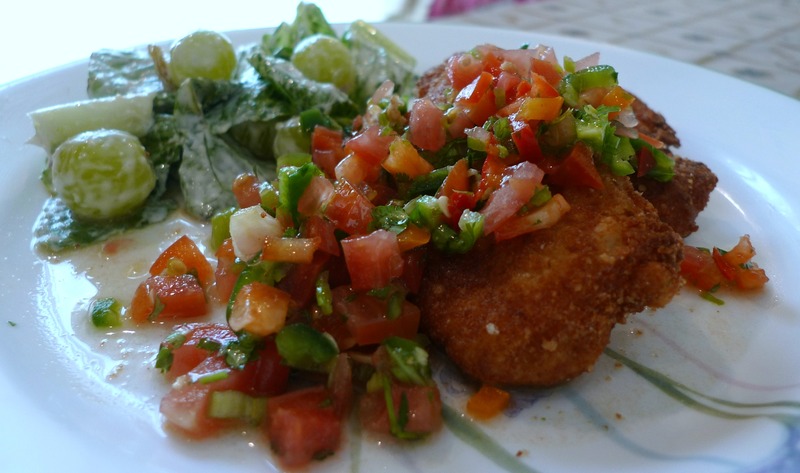 Okay… recipe today for is Parmesan chicken with chili salsa. Super easy to make and marvelous! Here’s the recipe just in case you guys want to try it. In a shallow bowl mix together the bread crumbs and the grated Parmesan, and pinch of salt. In separate shallow bowl, whisk together the eggs. Heat 1/4 cup of olive oil in a large sauté pan on medium-high heat. The oil should be shimmering, not smoking. Dredge the chicken pieces 1 piece at a time first in the egg mixture, then in the breadcrumbs. Then lay the pieces in the hot sauté pan. 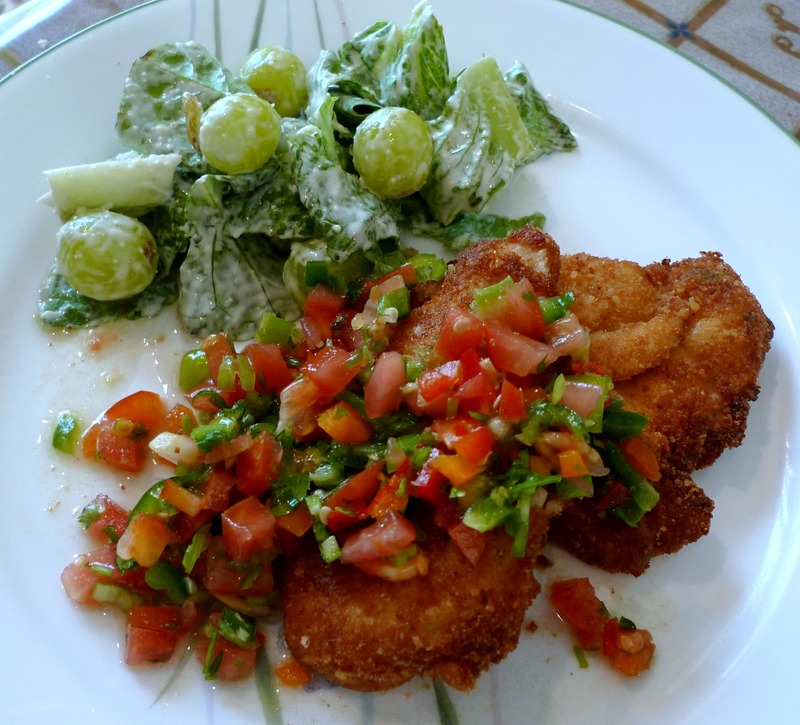 Turn the heat to medium, then gently fry the cutlets until they are golden brown, about 3-4 minutes per side. Diced the tomatoes, red chilies and green chilies. 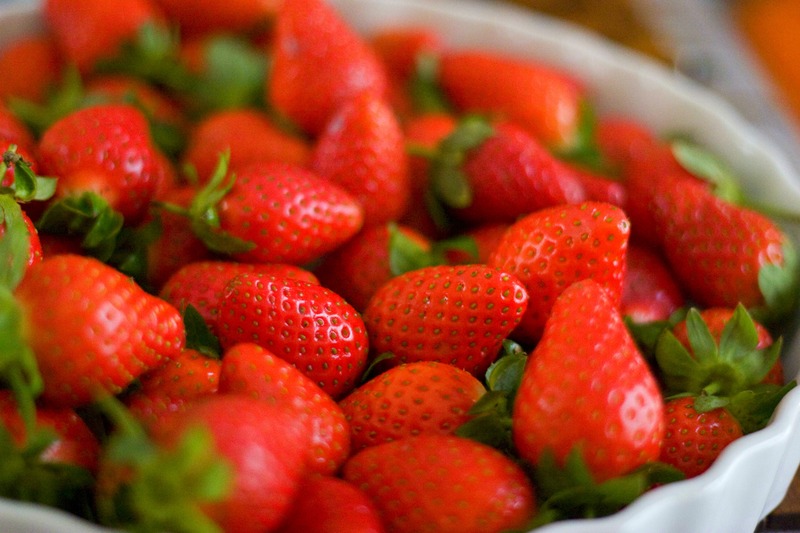 Place them in a bowl. Add the cilantro and mix them together. In a small bowl, mix together the olive oil and the vinegar and season to taste with salt and pepper. Pour into the salsa bowl. Toss well, cover and chill until ready to serve. Assalamualaikum and a very good morning to all. Yesterday my 3rd daughter, Sofea celebrated her 11th birthday. She got her early birthday present which was a bicycle last winter holidays. Few days back when asked what else she wanted for her birthday, she quickly said “Facebook!”. As usual my other half said that he will think about it. Anyway, we finally said yes to her after 2 years of waiting. So last night after her birthday dinner she spent a couple of hours in front of the computer playing “Pet Society” and this morning she woke up early(even though today is weekend) to play “Sim Social”…. so all the fuss about having her own Facebook is just so that she can play few games…. silly girl. Anyway I already told her this morning that should her result deteriorate, we will take back this Facebook, so jangan leka sangat la…. Facebook is only OK after homework and revision is done for the day. When I said “we will take the FB away if result teruk”…. muka dia semacam aja he he he. Okay…. 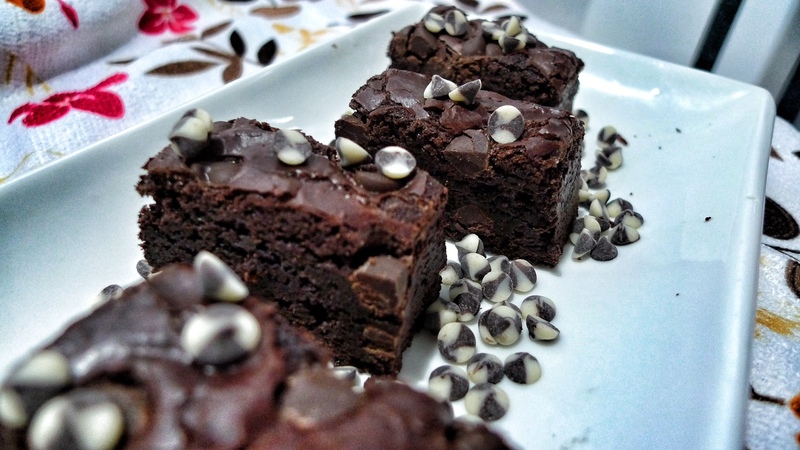 recipe for today is brownies. Last week Sofea asked me why I never made brownies, actual I did make them once but they didn’t like it. Then Nurin said “Sofea, brownies have nuts in it”. Well, my kids do not eat nuts when they are in cookies or brownies but will finish 1 kg of pistachio or cashew in a blink of an eye! So since earlier that week I saw this soooo nice looking brownies from Dari Dapur CT, I decided to try and make them. Success? Well, I made them at night and by morning there were only few slices left he he he. I made them again last Tuesday night and again by morning they were gone. Aina brought some to school and her friends loved the brownies too. So, you should try and make this, it is an easy recipes and if you want to add nuts in it, my all means go ahead. Enjoy! Preheat oven to 180C. Brush a 9-inch square baking pan with butter. Line bottom and two sides with a strip of parchment paper, leaving a 2-inch overhang on the two sides. Butter paper, and set pan aside. In a small bowl, whisk flour, cocoa, baking powder, and salt; set aside. Place butter and chocolate in a large heatproof bowl set over (not in) a saucepan of gently simmering water. Heat, stirring occasionally, until smooth, 2 to 3 minutes; remove bowl from pan. Add brown sugar; mix to combine. Add eggs, and mix to combine. Add flour mixture and chocolate chips; mix just until moistened (do not over mix). Transfer batter to prepared pan and sprinkle chocolate chips if you like ; smooth top. 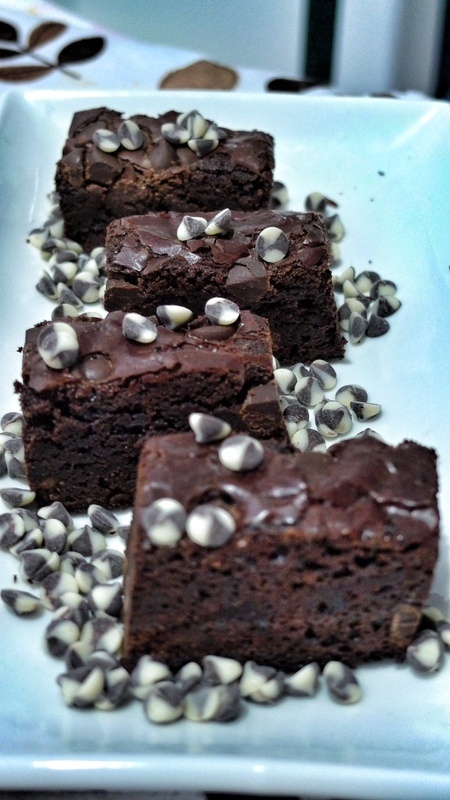 Super chewy, chocolaty and yummy! Howdy howdy howdy… I hope everyone is in good mental state on this lovely day he he he… Well, after a long 3-day weekend I think everyone should be fully recharged and eager to start their week regardless of what line of job they are in. Actually for us in Kuwait we started our brand new week yesterday (Sunday) because we had our public holiday on Thursday but it is not too late to wish everyone a wonderful week ahead. February is a very short month for us in Kuwait. Why? Well, Kuwait celebrates their National and Liberation Day on the 25th and 26th of February every year and the government normally will give few days extra. As for our kids’ school, this year it will be closed from 24th February to 3rd March, a total of 9 days break. Lots of people usually will take this opportunity to travel and if by now you have not booked your flight out of Kuwait, must probably you will have to stay here for that duration because the flights are fully booked already. Most people here make their February travel plans sometimes in December, so if you have missed the boat this year, make sure to put it in your diary so that you won’t miss it again! 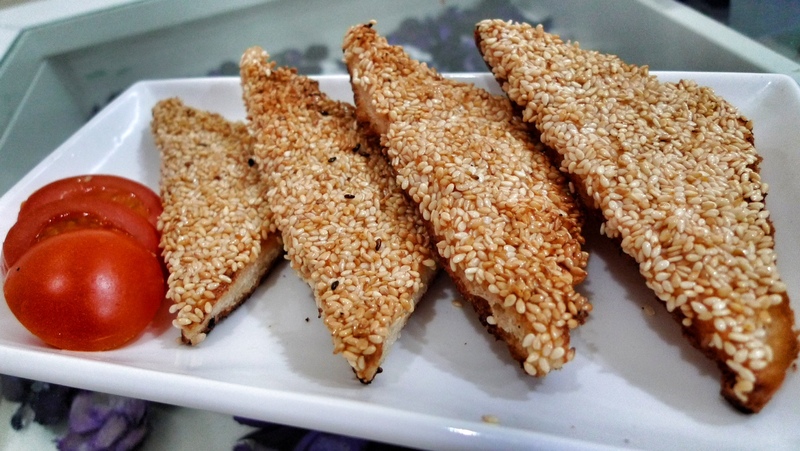 Okay… enough with that, lets talk about our recipe for today ; Shrimp toast. This is originally a Chinese appetizer called Hatosi (蝦多士) in Cantonese, Ha meaning shrimp, Tosi being a loan word from English meaning toast. This dish has over 100 years of history, originating in the Guangzhou Canton, in China’s Guangdong Province. 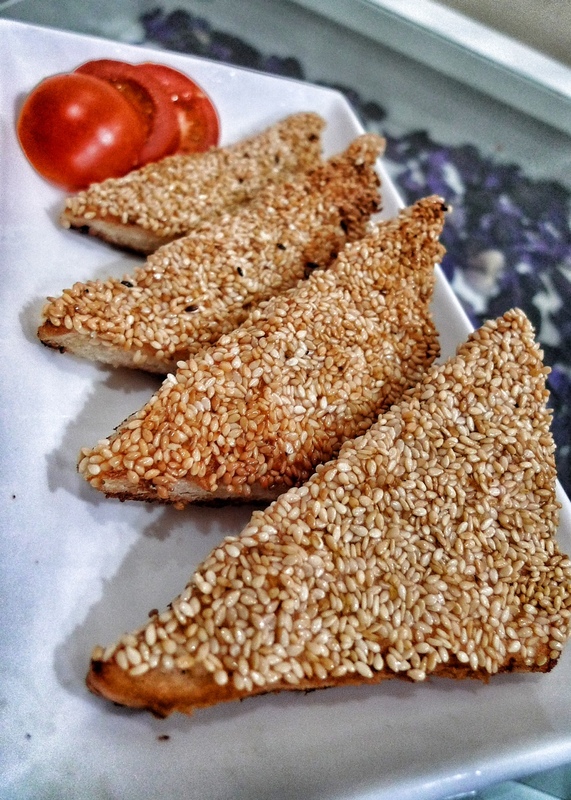 There are many different versions of this shrimp toast, but our family were introduced to this snack only a couple of week back by a friend at our favourite Thai restaurant here in Kuwait, where the shrimp paste-covered bread is dipped in sesame seeds before frying. This gives the end result a fantastic crunch and works perfectly with a sweet Thai sauce. Mix everything except sesame seed in food processor and pulse until become smooth paste. Spread the paste onto a slice of bread and then cut into half. 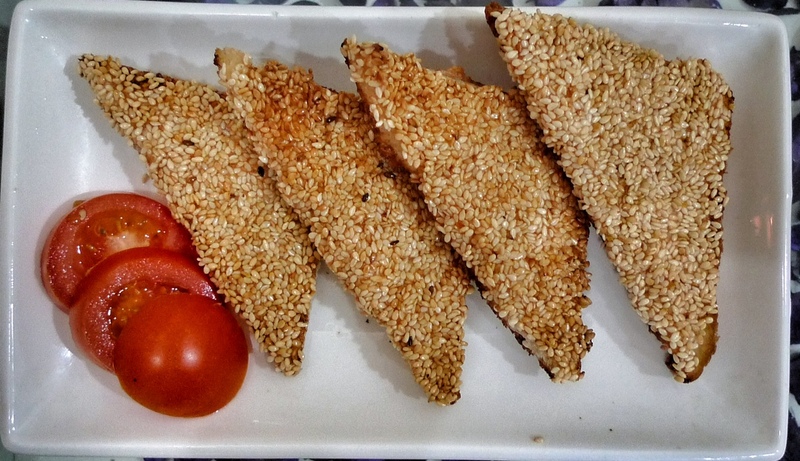 Coat with sesame seed. Add about 1/2 inches of oil to a heavy bottomed pan until it reaches approx 190C. If you don’t have a thermometer, drop a small piece of bread into the oil. If it rises to the surface and starts sizzling, it is ready. Add the toasts, shrimp and sesame seed side down. When the edges of the bread start to brown, flip the toasts over and fry the bread side until it is golden brown. Transfer to a paper towel lined rack with the bread side facing the paper towel to drain as much oil as possible. Serve with the Sweet Thai Chili Sauce for dipping. Assalamualaikum and good evening to all. For us in Kuwait, it is already weekend because the government decided to declare 2 February as a public holiday (Prophet’s Muhammad saw birthday) instead of 5 February. I think they decided to change the date to accommodate the Parliamentary Election which is tomorrow, 2nd February 2012. Kuwait’s weather were quite cold for the last 2 weeks and as the result of that, half of the family members had to pay a visit to the doctor again last week. Luckly this time, the smaller kids were not affected, thank God for that. Yesterday it was raining…. a very rare thing in Kuwait and it lasted the whole day (until late night actually) and today it is windy and cloudy… and normally if the weather is cold, the kids will get hungry easily. 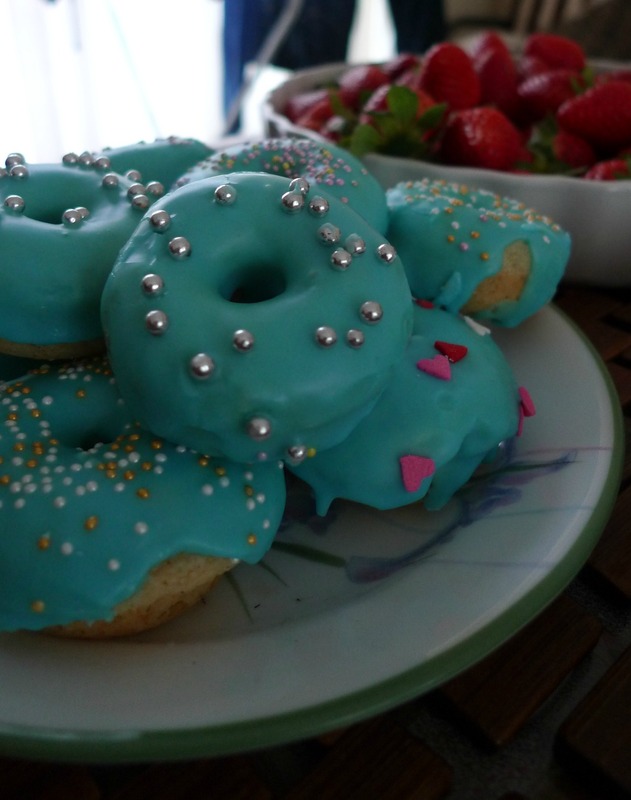 So I decided to bake these nice donuts that I have been putting it off for quite sometimes already. 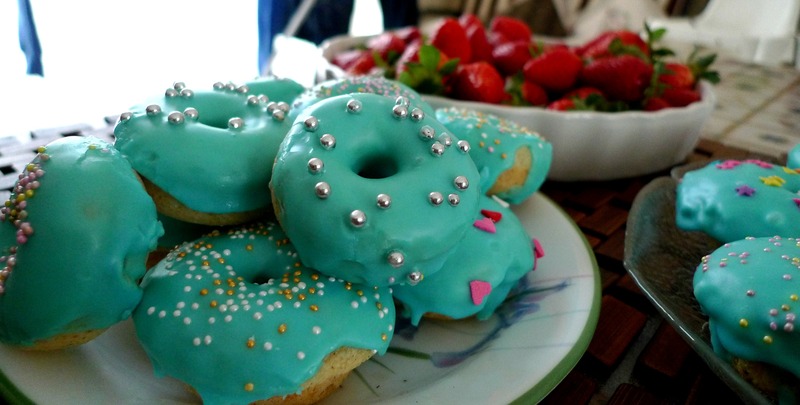 The donuts recipe was taken from Lemon Drop and the blue glazing idea was taken from Paty’s kitchen. 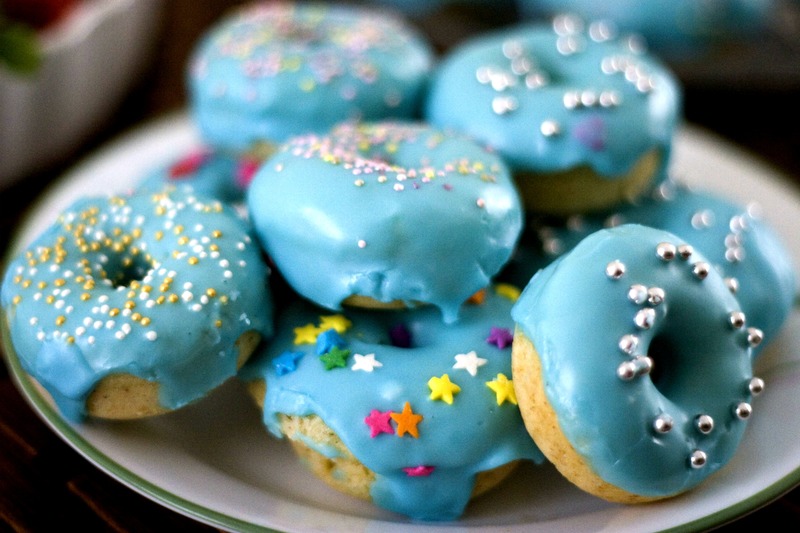 This donuts is different from the normal fried donuts that we are used to. This donuts has a texture of a cake and is super soft. The best part about this donuts that I love the most is, it is super easy to make and you don’t have to wait for 1 hour for the dough to rise…. lucky me! 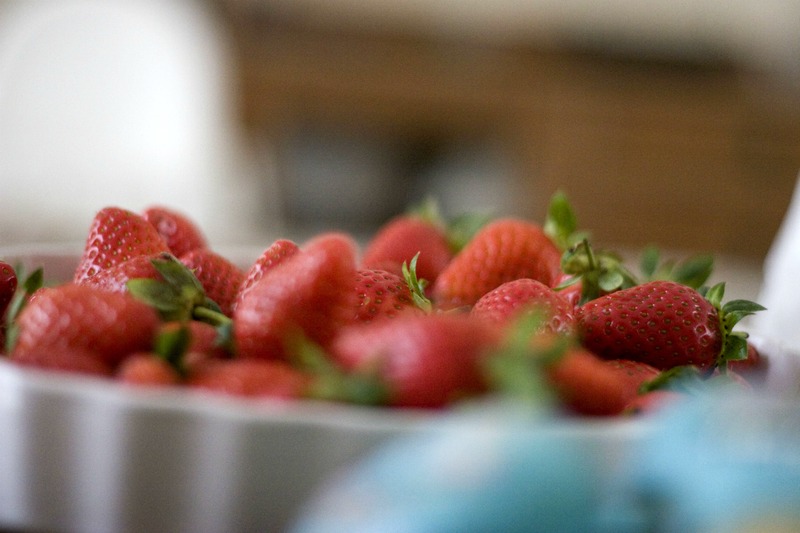 In a large bowl, sift together first 3 ingredients. Whisk in sugar, salt and cinnamon powder. In a medium bowl whisk together icing sugar, vanilla and milk until smooth. Dip top of donuts into the glaze and return to rack, right side up, sprinkle with some candy confetti and allow the glaze to set. Enjoy!